Item will be release on clearance of funds. Bridge Natural Living. This large pine cat shelf comes with a soft fabric, built in cushion for extra luxury for your feline baby. There will be no need to 'paws' for thought as your kitties will love this design. This shelf comes in either Natural Pine, Black, White, Walnut or Grey stain. Red, blue and yellow wood dye is also available. Brackets are available in white, brown, black or silver to fit in with your current decor. The length of this shelf is 55cm and the width is 26cm. As each item is handmade to order, please allow 1-2 weeks for delivery. -High quality 1/8" Hardboard and measures 4" x 5". -Mulit-colored and made in the USA. -Great for door handles, doors or will look great on you wall. -Comes with attached twine for easy hanging. This large pine cat shelf comes with a cow print fabric, built for extra luxury for your feline baby. There will be no need to 'paws' for thought as your kitties will love this design. This shelf comes in either Natural Pine, Black, White, Walnut or Grey stain. Red, blue and yellow wood dye is also available. Brackets are available in white, brown, black or silver to fit in with your current decor. The length of this shelf is 55cm and the width is 26cm. As each item is handmade to order, please allow 1-2 weeks for delivery. Kind: Toy For Cat. Material: Wood. This large pine cat shelf comes with a fabric, built in cushion for extra luxury for your feline baby. There will be no need to 'paws' for thought as your kitties will love this design. This shelf comes in either Natural Pine, Black, White, Walnut or Grey stain. Red, blue and yellow wood dye is also available. Brackets are available in white, brown, black or silver to fit in with your current decor. The length of this shelf is 55cm and the width is 26cm. As each item is handmade to order, please allow 1-2 weeks for delivery. Handmade pet cat or kitten furniture. Designed and Manufactured in Ft Lauderdale FLorida,USA. PROTECT YOUR FURNITURE AND GIVE YOUR CAT A RELAXING CHAIR AND. High Quality Unique Cat Scratch Board and Combo S Shaped Chair/Furniture. Versatile – Lay Flat for Kitty to reline /rest on. Cat Relaxes between the S Curves in the Furniture and it is carpeted with scratch textured fabric. 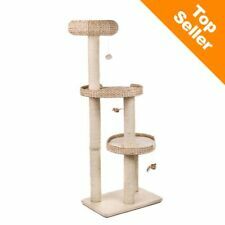 Great for any Cat Big or Small. Wooden Base. Wooden Base 11" x 11". Licit chew guards protect water bottles against animal chewing. Constructed heavy duty premium galvanized steel. It is full cap protection. Holds 8-ounce water bottle inside cage. Ideal shelter with back escape door. The eaves are designed to block rain. The house is suitable for small pets of all ages and activity levels. 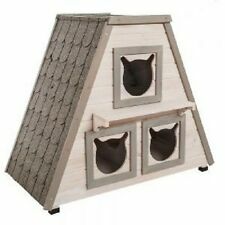 1 x Cat house. Fits 1 cat under 15 lbs. Good match with indoor and outdoor decoration. 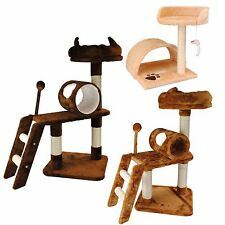 Are you searching for a toy to your lovely cat?. 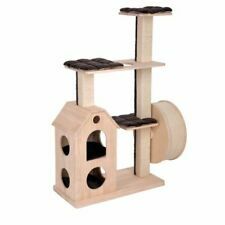 It not only can be used as a toy for your cat to climb and jump, but also can be used as a bed for your cat to sleep. 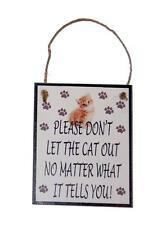 Besides that, it also can keep you furniture from scratching by cat. Includes condo with side floor and balcony with latticework. 1 x Cat house. Don't hesitate to buy one! Protects your pet from ground chill and wet conditions. Good match with indoor and outdoor decoration. The Pet Life Cat-Eyed Ultra Premium designer contoured cat scratcher lounger is composed of ultra-premium and durable recycled cardboard featuring Non-Toxic glue made of corn starch. Constructed with superior cardboard and built-to-last longer than the conventional cat scratcher. 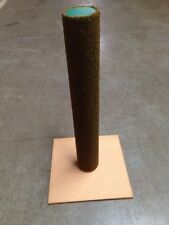 GREEN FELT MATERIAL - HARWOOD STAND. THE ITEM WAS MANUFACTURED IN THE LATE 1970'S-EARLY 1980'S AND HAS NEVER BEEN USED. WOOD PIECE AND SPRING AT THE TOP THAT CAN BE ADJUSTED FROM SIDE TO SIDE. 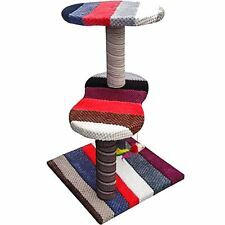 Funny cat scratching slider takes cats so much fun to keep them off from the expensive furniture’s and your legs. Get yours now while on Sale. ➤ Cat climbing can fully satisfy the animal habits of cats climbing up and down. 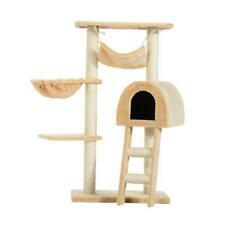 Cat Climbing Tree is a fashionable pet tool for providing a spacious room where cats can fully enjoy themselves. Your little friend will spend countless hours playing with this durable and stimulating toy.